Vietnam has a developing planned economy and market economy. Vietnam has become a leading agricultural exporter and served as an attractive destination for foreign investment in Southeast Asia. In a similar fashion to other Communist countries after the end of the Cold War the planned economy of Vietnam lost the momentum for productivity and sustainable growth. In the current period the economy of Vietnam relies largely on foreign direct investment to attract the capital from overseas to support its continual economic rigorousness. Manufacturing, information technology and high-tech industries now form a large and fast-growing part of the national economy. Though Vietnam is a relative newcomer to the oil industry, it is currently the third-largest oil producer in Southeast Asia. Mobile phones and their parts were both imported and exported in large numbers, while in the natural resources market, crude oil was a top-ranking export and high levels of iron and steel were imported during this period. As a result of several land reform measures, Vietnam has become a major exporter of agricultural products. It is now the world's largest producer of cashew nuts, with a one-third global share; the largest producer of black pepper, accounting for one-third of the world's market; and the second-largest rice exporter in the world, after Thailand. Vietnam is the world's second largest exporter of coffee. Other primary Vietnamese exports include tea, rubber, and fishery products. In the last 5 years, Vietnam's exports have doubled as competitive minimum wage and low costs of utilities boosted foreign direct investment. Vietnam main exports are clothing and footwear, machinery, transports and equipment. 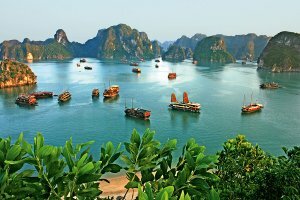 Other exports of Vietnam include food, live animals, manufactured goods and fuel. Main export partners of Vietnam are the United States, Japan, China, South Korea, Malaysia and Germany. Vietnam has been, for much of its history, a predominantly agricultural civilization based on wet rice cultivation. There is also an industry for Bauxite mining in Vietnam, an important material for the production of aluminum. However, the Vietnam War destroyed much of the country's agrarian economy, leading the post-war government to implement a planned economy to revitalize agriculture and industrialize the nation. Vietnamese authorities have reaffirmed their commitment to economic modernization and a more open economy. Vietnam joined the World Trade Organization in January 2007, which has promoted more competitive, export-driven industries. Vietnam joined the 12-nation Trans-Pacific Partnership free trade agreement negotiations in 2010. In 2014 the country negotiated a free trade agreement with the European Union which would give it access to the EU's Generalized System of Preferences, which provides preferential access to European markets for developing countries through reduced tariffs. Vietnam main imports are machinery, transports and equipment, telephones, integrated circuits, iron, fabrics and manufactured goods. Other imports of Vietnam include chemicals, fuels, food and crude materials. Main import partners of Vietnam are China, Korea, Japan, Taiwan, Thailand and Singapore. 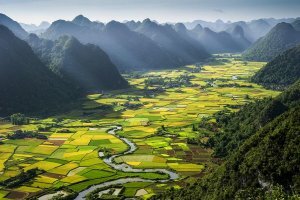 Vietnam is the easternmost country situated on the Indochina Peninsula in Southeast Asia, bordered by China, Laos, Cambodia and Malaysia across the South China Sea. Vietnam is a member of the Asia-Pacific Economic Cooperation (APEC), Association of Southeast Asian Nations (ASEAN), International Monetary Fund (IMF), World Customs Organization, World Trade Organization and other international organizations. Tariffs and duty rates are frequently revised and the tariffs levied are decreasing in line with the country’s WTO commitments. Surtaxes can be levied in exceptional cases, such as countervailing duties as anti-dumping measure. Vietnam has issued over 5000 product standards, many of which are in accordance with international standards. Specific information can be provided by import partners or may be sought from the relevant ministry or authority or from the Directorate for Standards and Quality (STAMEQ) under the Ministry of Science, Technology and Environment. - chemical listed in Appendix III of the Rotterdam Convention and other toxic chemicals and pesticides, plus products containing asbestos or Chlorofluorocarbon (CFC) waste and scrap. - type one toxic chemicals stipulated in the Treaty Prohibiting Chemical Weapons and in Annex III of the Law on chemicals and its Decrees. Companies may choose to produce within an Export Processing Zone (EPZ) in order to take advantage of the exemptions from customs duties. Industrial Parks (IPs) offer various support services as well as tax advantages. The specific incentives and support measures that are available vary across individual EPZs and Ips. Health certificates are required to import plant and animal products. Live animals require certificates attesting that they are free of communicable diseases. Pharmaceutical products must be registered and approved by the Ministry of Health. All imported foodstuff for consumption in Vietnam requires a Certificate of Analysis. The most common method of payment for import transactions into Vietnam is Confirmed Letter of Credit. Distributors will typically ask for between 30 and 180 days payment terms. Circular No. 128/2013/TT-BTC, guides import and export procedures. Several copies of documents can be required to complete the import procedures. The necessity of translations into Vietnamese can be specified in the import contract. Originals should be signed with blue or red, but not black ink. A certificate of inspection or documentation confirming exemptions from inspection, as well as an import licence are required for certain types of goods. E-customs declarations are possible and welcome. Include the same type of information as a commercial invoice. Importer’s instructions should be followed and all information must conform with other shipping documents. Use of a packing list is recommended even if not specifically required by the import contract. Having obtained insurance coverage for a shipment, a copy of the insurance certificate or insurance policy should be included in the import dossier. Loss or damage of a shipment is possible in the form of cargo insurance or of a contingency insurance clause.